Beautiful flower, isn't it? Somewhat familiar, you say? For you veteran gardeners, you'll recognize that it's probably a member of the nightshade family, and you're absolutely right. For those of you whom I talked into buying a seedling of this plant this past spring, you'll also recognize it, as you should have it handsomely growing in your gardens by now. 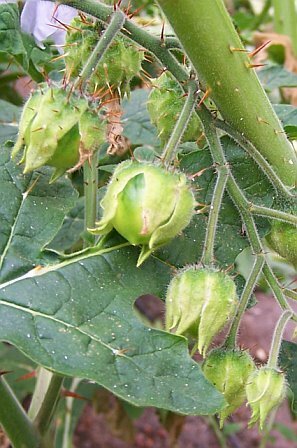 For those of you who have grown tomatillos before, you'll find its husk-covered fruits somewhat familiar (without those thorns, of course). This plant is an interesting sister of the tomato and of the tomatillo. It's called Morelle de Balbis, or less elegantly, the Litchi Tomato. A member of the Solanacea family, its proper name is Solanum Sisymbriifolium. I received the seeds of this beautiful plant from Sylvain, Alan Passard's head gardener, when I was fortunate enough to visit the chef's farm outside of Le Mans, France. Out of all the plants Sylvain was cultivating for Passard's world-famous restaurant, L'Arpege, he wanted me to have these seeds. Sylvain doesn't speak English, and I don't speak French, but I could tell just by looking at the seed that it was a nightshade plant. The seed looks like an exact cross between a tomato and a pepper. He told me through an interpreter that the fruit tasted like a cherry. I was in. I hid the precious seeds in a side pocket of my suitcase, and forgot to declare them when I came back through Customs in the States (this is actually true, I ignorantly declared all of the oth er seeds I had carefully selected and purchased while traveling through Europe; and watched in horror as the Customs agent wordlessly grabbed the hefty stack and threw it into the trash). When I was ready to germinate the seeds, I couldn't find any information about them on-line, but their care must be just like a tomato, I surmised. And indeed they were. They grew and flourished exactly like one. Except for the thorns. Take a look at these thorns! They're on just about every surface of this plant: the stems, both upper and lower sides of the leaves, even the fruit husks! I also realized that they need staking, just like most well-tended tomatoes do. We put them in our standard 7 foot tall by 2 foot wide concrete-reinforcing wire cages. The other thing I learned about the Litchi Tomato is that they need a pollinator. That is, you must grow at least two plants together, not just one. If you only grow one, you won't get any of the blossoms pollinated. You need those blossoms pollinated in order to have it turn into a fruit. Somewhat like a tomatillo, the ripening fruit will burst the husk, revealing that it's ready to pick (with heavily gloved hands). I wait for the red fruit to start to soften, which is what you should do for a tomatillo or a tomato to ensure maximum sweetness. These seeds are hard to find, but I think you can do so through the Seed Savers Exchange if you are a member. Eventually I will have lots of litchi tomatoes. They are extremely prolific. Do you have a recipe whereby I may feature them? Shelly: They're not toxic to animals. Even if they were, the animal would most likely leave it alone due to all those crazy thorns everywhere! Sarah: You need several of these plants in somewhat close proximity in order to act as pollinators for each other. You may not be getting any fruit because they are spaced too far apart or you only have one plant. Hi, I bought some morelle de balbis seeds and planted them, everything is going fine, except that the fruit doesn't seem to be setting. I live in southern California. Any tips would be greatly appreciated. I believe this is what I have found this season in my western Oregon garden, there are several. I have never seen them before, so they have come from the birds, I guess. How can I get them positively identified and are they toxic to my animals? I have a crazy cat that eats all my plants! I have some of these in my veg/fruitgarden and they really are scary. The 'tomatoes' aren't ripe yet, but I'm curious what they taste like. Santa Cruz so I had to say aloha! Craig: My educated guess would be that it would be deer resistant (realize, though, that a really hungry deer will eat even so called deer "resistant" plants). Also, the Morelle de Balbis is an annual, so you will not get year 'round decorative beauty out of these. They are pretty impressive for a couple of months in mid to late summer, though. 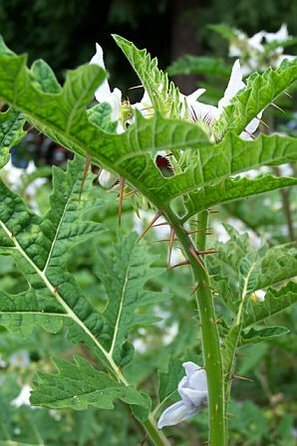 Does anyone know if these thorny plants are eaten by deer? I have to fence them out of my vegetable garden but would like to try this plant in front of my house. absolutely divine :) love those plants!! I'm glad you chose one of our photos. I think its a plant you plant once in your lifetime... never again.Good luck for the harvest.If you have chain mail gloves you can perhaps make a good pie. I wish I could post the pictures of the incredable harvest I am having this summer. 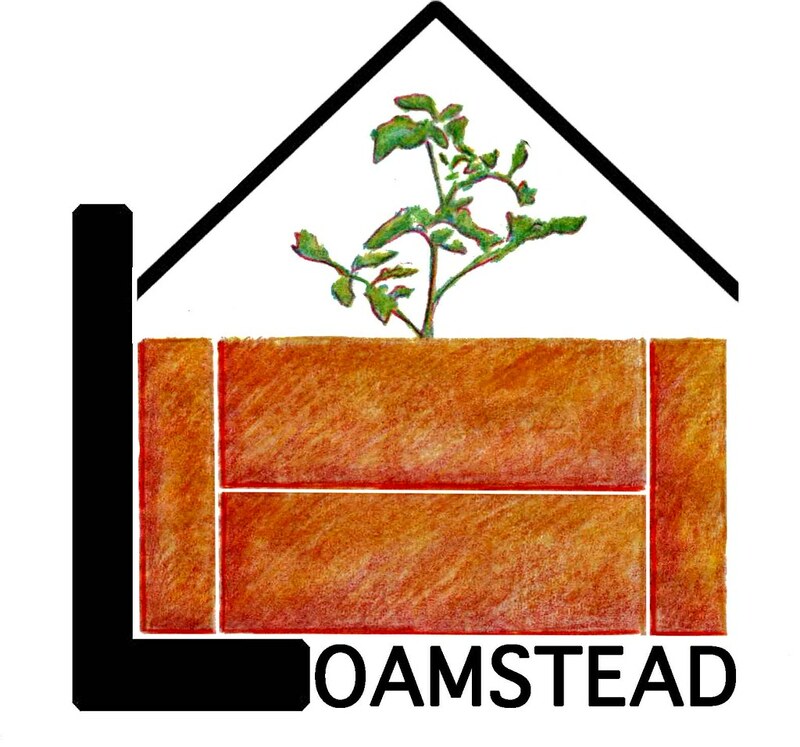 I took your summer gardening class and followed each of your suggestions. I'm having a blast and enjoying the delicious produce. Can't wait now to take the winter gardening class. And my tomatoes are huge, loaded with fruit, never had I had such success. Cheers to those fishheads! Thanks again for sharing all of your wisdom. Good news from the next-door neighbor: he had a ripe fruit, and pronounced it "fantastic." Thank you for the plants you gave us to give him a birthday gift. He's the best neighbor, and our gardens are a mutual joy for each other to visit. XOX from Soquel. I'm coming up there SOON with Rebecca and Jasmine: farmer friends who love your work. I'm sold. I'd love to try one next year. I assume I'd harvest them the same as cactus for nopales--welding gloves and needle-nosed pliers. Going barefoot in that area of the garden would definitely be out as well, but they look like they'd be worth it. They look like they might be sweeter than ground cherries, and larger too. 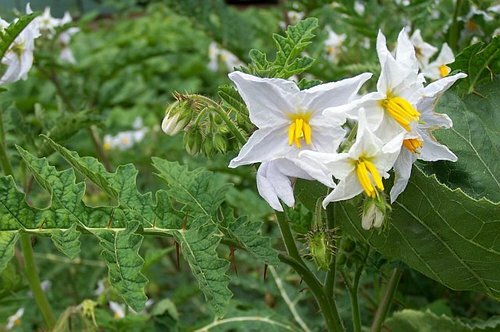 I remember my Grandfather used to plant this solanum every few rows of potato's, much as one would plant geraniums with roses. If I remember correctly his theory was that the Litchi Tomato would attract roundworms away from the potato's. He swore that was why he never lost potato's to roundworms (which as potato growers know can be quite devastating to potato's) I don't remember ever eating the little tomato's though. I have been looking for a thorny barrier plant. This one could do the job for summertime. I bought one of these plants from you at your seedling sale. Mine's about 5' now, and covered with blossoms, although it seems to not want to set fruit, or it is extremely slow to do so in my garden (I'm zone 9 in Lodi). The spikes are ferocious and will poke you through jeans. I look forward to some ripe fruit, though it'll have to be harvested using welding gloves! Our plant has fruit setting, though none ripe yet, and the plant you gave me to give my neighbor is about SIX FEET TALL. Yesterday morning, some people walking on the trail by our yard stopped to comment how beautiful our garden is. We got chatting, and one of the women came over to look. She asked, "What on earth is that weird-looking plant?!" so I got to tell her the whole story. And told her about your classes, your farm, and your farmstand. I had heard of Litchi Tomatoes but agree that Morelle de Balbis is a much more elegant moniker. Always the experimenter, I'm hopeful that there are some seeds available this winter so we can try it out next spring - though we'll have to be sure and set them where we wont get impaled. I'll also have to remember to use the rhino hide gloves - something I rarely do when working in the garden. Part of my love of gardening is feeling my fingers in the dirt and on the plant but I can see that I'll have to forego that pleasure with this little prickler! Thanks for sharing this one with us. That is one scary looking plant! But with a name like Litchi Tomato, I'm sold--if it tastes anything like a litchi (or the cherry they claim), I would totally love one of those babies. Now, the only problem would be how to grow them and make sure my kiddos don't get near enough to get hurt!